Study when you want to! 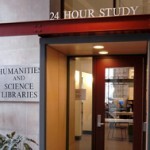 The MIT Libraries are happy to offer students three 24/7 study spaces located across campus. These spaces are for use by the MIT community. Use your MIT ID to access the spaces after hours. Please see Guidelines for 24/7 Space Use for complete information. Please note: Particular areas in the libraries below have been designated 24/7. These spaces are open during regular library hours and accessed from inside the library. When the library is closed, the study spaces are accessed from a “24/7” door outside the library. There is no access to collections.